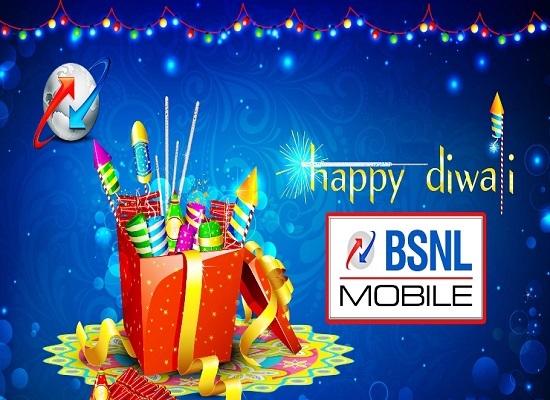 National telecom backbone, Bharat Sanchar Nigam Limited (BSNL) has announced Diwali Special Offers for its prepaid mobile customers from 15th October 2016 on wards in all telecom circles. All existing / new prepaid mobile customers will be offered 10% extra free calls on BSNL's most popular Voice STVs - 159, 201, 359 & 449 from 15-10-2016 to 31-10-2016 on PAN India basis. All other terms and conditions would remain same. The above tariff will be applicable as a promotional offer with effect from 15-10-2016 to 31-10-2016 on PAN India basis. The implementation of the tariff will be made in accordance with 43rd Amendment of Telecom Tariff Order and orders/guidelines/clarifications issued by TRAI from time to time. On completing 16 years of glorious service, BSNL launched Foundation Month Special Data STV @ just Rs 16/- which offers 60 MB Data for 30 days. New Data STV 16 is available from 7th October 2016 to 31st October 2016 in all telecom circles. Dear readers, please share your views and opinions about BSNL's Diwali Special Offers 2016 via comments with us.